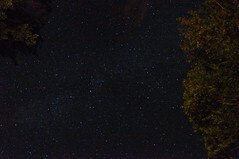 The skies above the San Juan Islands are amazing, wide open to the night with no light pollution, and no haze. Post-processed in Lightroom, this is the result. It doesn't do the skies justice.